At 17-years-old, Mark DeMontis was headed into his midget year with his AAA Toronto Young Nationals team when he noticed something wasn’t right. Never having previously experienced any vision problems, DeMontis was admitted to SickKids where he was diagnosed with Leber’s Optic Nueropathy – a disease that causes those affected to lose central vision in both eyes. “One year you’re thinking you have an opportunity to get to the next level in the game and the next you’re playing at a much lower level,” recalls DeMontis, who continued to play at a recreational level. Despite his deteriorating vision, DeMontis was determined not to let his situation detour him from being involved in the game. 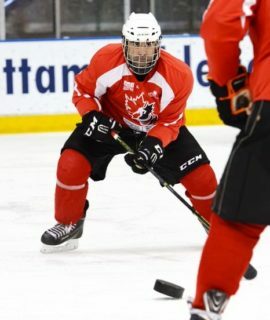 An undying love for the game and a passion to help others with similar conditions led DeMontis to start Courage Canada – a non-profit organization dedicated to helping blind youth play hockey. Set on raising awareness and funding for the new charity, DeMontis started using his rollerblades again. Cruising up and down his street in Toronto quickly led to exploring local trials, and eventually a 5,000 kilometer cross-country trek in 2010 from Vancouver to Toronto. The journey provided Courage Canada with a funding base as Mark spent the next 5 years traveling from coast-to-coast, connecting with blind youth and adults, and creating blind hockey programming in various communities. Since then, Courage Canada – now the Canadian Blind Hockey Association – has seen significant growth. Tournaments and camps run by the Canadian Blind Hockey Association currently run across Canada four times yearly. Modifications to the game are made in order to accommodate vision impaired players, including a larger and slower puck that makes noise. Despite his busy schedule, DeMontis still finds time to stop by his cousins’ GTHL games.